When we think of summer dresses, it’s always about light, airy, breezy styles. Peasant tops, flowing dresses, some ruffles, some floral. I was already crushing on floral trends for the last summer season, and this year, I’ve opted for light patterns on a mustard dress. 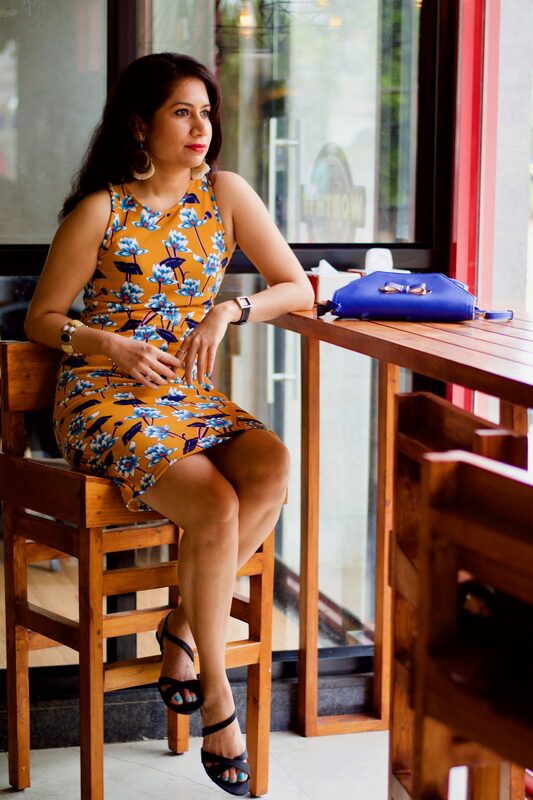 I feel summer dresses are not complete without florals and soon, I’ll be sharing more options you can use for the summer fashion wardrobe. This time, as a part of my summer fashion wardrobe, I’ve opted for a casual-chic. This bodycon dress is casual while retaining a dressy flavour. The fabric is lightweight and does cling to the body but not in an uncomfortable way. You can add a casual touch with white sneakers to give it a new twist. You can also throw on a lightweight shrug to protect your skin from the sun. That way, you turn a sleek bodycon dress into a casual-chic attire with a couple of accessories. Summer dress designs also include the use of nautical stripes, bold colours, maxi tops, the flirty slinky dress, animal prints, polka dots, and gingham. These are easy to pair with flats that are strappy, tie-ups, gladiator style, or you can easily slip on your summer sneakers. I personally love long and flowing styles but sometimes, it can get difficult to move around quickly particularly if you are working and putting your stylish foot forward! Indian wear for the summer has a large emphasis on the print-on-print fashion. I’ve noticed long flowing styles and short kurti in various shapes and cuts to flatter the Indian body type. But, I personally prefer plain colours for the Indian summer wardrobe. I’m sharing a collection of my favourite summer dresses you can order online. I hope you get some good summer dresses ideas. Do write your ideas below.